It’s a treasure trove of treats and discoveries down in the sea. This Halloween, join us at Spooky Seas as we sail off into more spooky adventures – pirate style! Unveil the chilling truths about marine animals, use your wit to bag yourself some treats, and watch pumpkins turn into lanterns under the sea. Legend has it that the best treats are hidden in a treasure chest within a haunted shipwreck. But the evil skeleton pirates that rule this shipwreck have kept even the bravest divers at bay. Now, you have the power to unlock these secret treats. 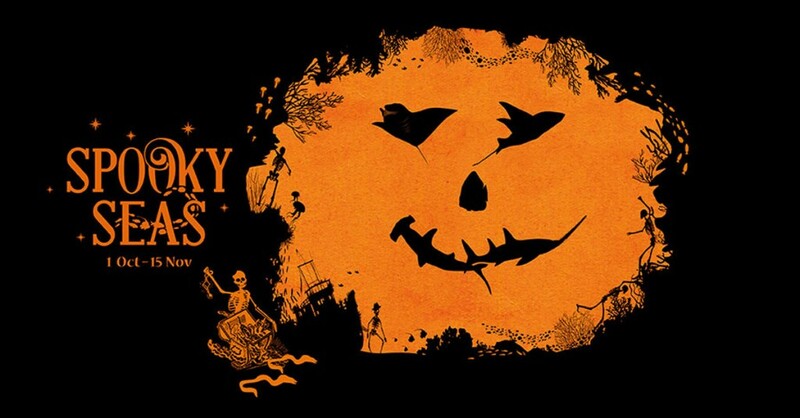 Simply embark on the Spooky Seas Trail and complete a task at each of the five stations – Fishy Graveyard, Mad Scientist’s Lab, Pumpkin Patch, Vampire’s Lair and Potion Parlour. With wit and speed, solve puzzles, pick up treats and collect all the ingredients needed to concoct a magic potion to release the ultimate prize. Good luck! They are the guardians of the forgotten sea depths, rising from the darkness only during Halloween. Feel the chills as they swim by, and don’t forget to capture evidence of their rare appearance. You may have seen pumpkin carving demonstrations on land. But underwater? Come witness this feat as our divers carve pumpkins into Halloween lanterns from within the habitat. Come say hi and take plenty of pictures with our friendly Manta Ray mascot. He will be “swimming” by at these times – 2.45pm and 3.45pm daily. Home to over 40,000 fish across 80 different species, join our marine guides and let them share with you interesting facts about the Open Ocean Habitat, and the unique adaptations of its inhabitants. Learn more about our dolphins, and find out what you never knew about these endearing animals, direct from our dolphin trainers. Understand the feeding habits of our marine animals and view how our aquarists hand feed the sharks and rays. For further information, visit S.E.A Aquarium website.